Every couple of months we receive word of the latest and greatest in fabric technology that will be an industry change-agent. And for the most part, it’s true. Each decade since the early 70s when running shoes were introduced, the demand for better and more advanced materials continues to grow as more and more athletes lead us into world’s unexplored with greater need for protection from Mother Nature’s sometimes turbulent weather. This week, two industry giants introduced new fabrics worth mentioning for our Friday news feed. Why? Because we’re going to see a lot more of them incorporated into the apparel we wear, and eventually fall in love with, when we’re out on our next adventures near and far. The first we heard from was Polartec, with the brand’s 100-percent Recycled Power Fill Insulation. Powerfill has been around for a while at 80 percent fill. This bumps it up by 20 percent. Here’s what the company had to say this week. 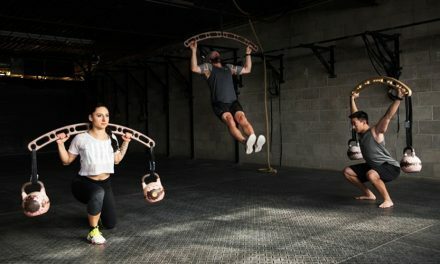 Keep in mind this stuff takes a log time in the R&D labs to produce and there are a lot of really great people working long hours behind the scenes to bring this to a talking point, plus the ambassador athletes who clock in the miles and present feedback to get to these announcements. Let’s jump in. 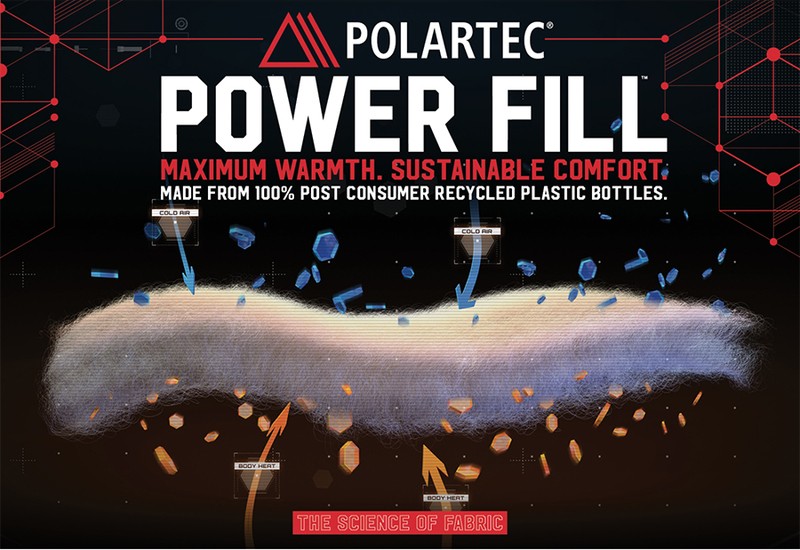 Polartec upgraded Polartec Power Fill insulation from 80 percent, introduced just a year ago, to 100 percent post-consumer recycled materials, a big milestone for the brand. Polartec now upcycles over one billion post-consumer plastic bottles into hundreds of fabric styles and category-creating uses. Why choose to wear Power Fill? First, it’s really lightweight, but it’s also really warm, dries super fast and compresses down to a fraction of the garment’s size. What you don’t physically see is that the fabric is made of hollow fibers that are bonded together through a manufacturing process that reduces environmental impact. The process produces a stable layer that removes the need for disposable scrims, stabilizing agents or carriers found in competitor fabrics. And when you take away the not-so-necessary scrims, you reduce weight and keep the balance of warmth-to-weight ratio and recycled content measurements in balance. If all that is too techie an explanation, then think of it this way. Power Fill is warmer for its weight, reduces cold spots and opens up countless design possibilities … and removes plastic from our landfills. That’s pretty cool. On to Black Diamond. If your a climber, skier or just enjoy the mountains, you’re all-to-familiar with Black Diamond. And it’s not just because of the logo. BD is consistent with building innovative products and actively working with ambassador athletes to give feedback on their designs from all over the world. And it’s this inventive spirit that leads to new technologies for the Spring 2019 Apparel collection. Let’s step back up a minute and introduce Green Theme International (GTI), a fabric tech company that created a PFC-free DWR that permanently bonds finishes to fibers without using a single drop of water or releasing hazardous waste into our environment. When BD was approached with the technology, they partnered with GTI on the brand’s Spring 2019 apparel collection.“We are pleased that Black Diamond Equipment has selected Green Theme International to be the central component of its Spring 2019 technical outerwear wind collection. GTI’s rigorous product development and focus on innovation align perfectly with Black Diamond’s. It is exciting to work with a company that continually aims to bring the most advanced technologies to market, which provide the ultimate in performance and style.” — Brian La Plante, strategic marketing director, GTI. Compare GTI’s finish to any other C-6, C-8 or C-0 DWR and you’ll find it exceeds in durability because it’s permanently hyper-fused to the individual fabric fibers, and there’s no reason to ever refresh the jacket with an additional spray or wash-in finish. 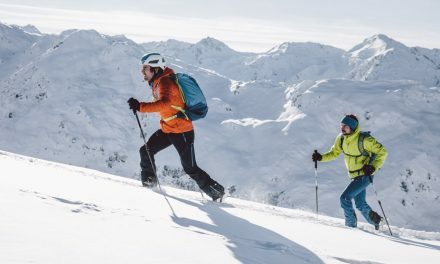 The technology will debut in BD’s Spring 2019 Distance Wind Shell, shown left, and grow in future seasons into the BD.Dry ski, alpine and rainwear collections. 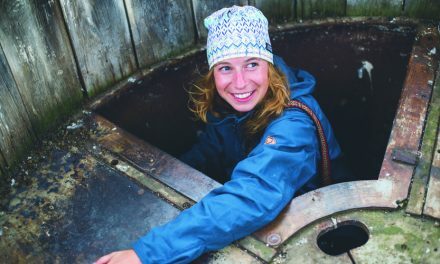 The Woolmark Company, a subsidiary of Australian Wool Innovation, a not-for-profit company owned by more than 24,000 Australian woolgrowers, is taking an active role in educating the internal Black Diamond R&D team and connecting them with a greater range of wool suppliers, which is great for the smaller wool growers. Black Diamond’s Rhythm Tee features a breakthrough co-developed with Nuyarn Merino wool fabric technology at a superlight 95g/meter. That’s a big deal because it makes a significantly lighter tee that’s more durable, which means it’s going to perform a whole lot better when you wear it. Rhythm’s Nuyarn fabric also dries 5x faster than Merino and gives you 35 percent more stretch, so it’s a powerhouse breathable base layer for trail running. Besides being able to throw it into the washing machine, the tee is certified by the Responsible Wool Standard (RWS). Another key driver of BD’s Spring 2019 apparel collection is BD.cool. If you don’t know the name, it’s a mineral based in-fiber cooling technology that reflects 71-percent of near-infrared rays and reduces your body temperature. 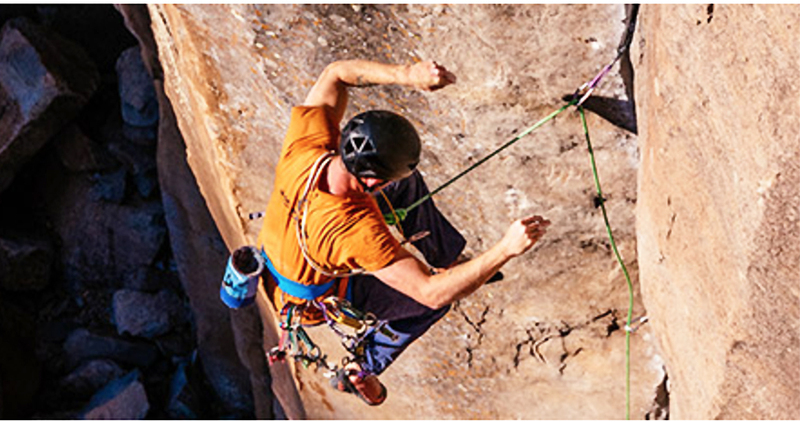 BD.cool was created for elite climbers and mountain runners who love it. So why not use the technology in tops for Spring 2019 for everyone. And then’s there is the partnership with YKK, the world’s oldest and largest zipper manufacturer. 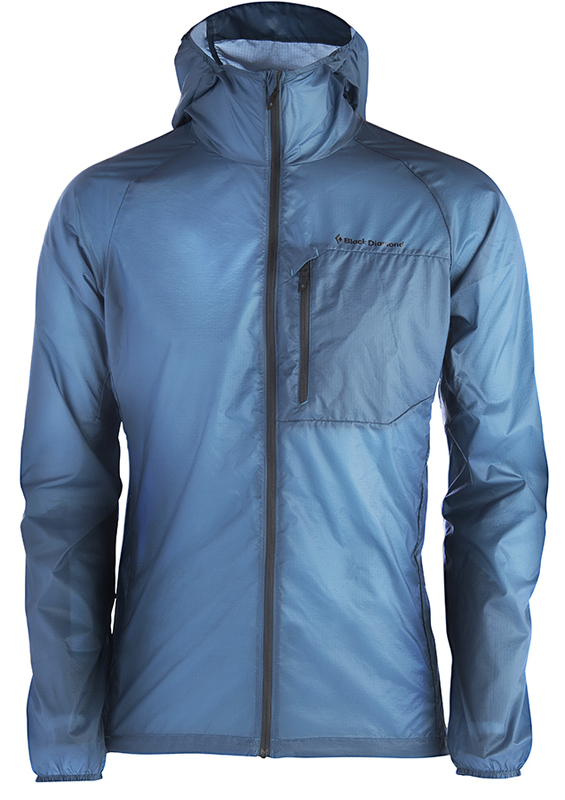 You’re getting a 40 percent lighter zipper in BD’s Deploy Wind Shell that uses 5 denier nylon fabric which comes out of Toray, Japan and weighs just 48 grams. Last, but not least, BD worked with Cordura on its Forged Denim Spring collection. 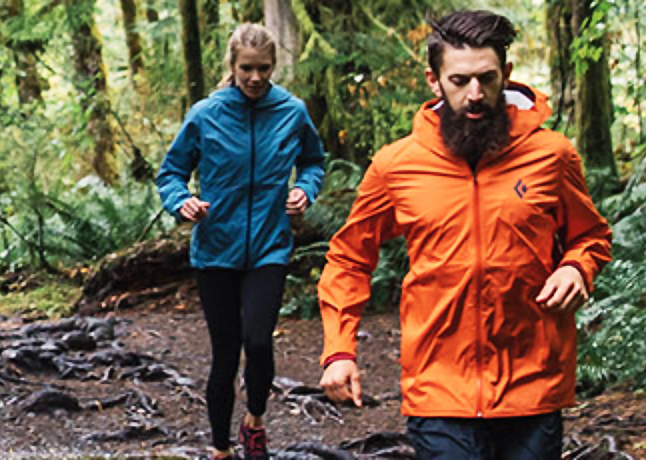 You’re going to see a combination of unbelievably light and stretchy fabric with climbing specific features. The future of performance clothing will continue to evolve with brands like Polartec and Black Diamond leading the way. The greatest of these achievements is smart textiles that are more kind to our environment and are having a lasting impact on athletic, extreme sports and our military industries. And we are greatful for that.